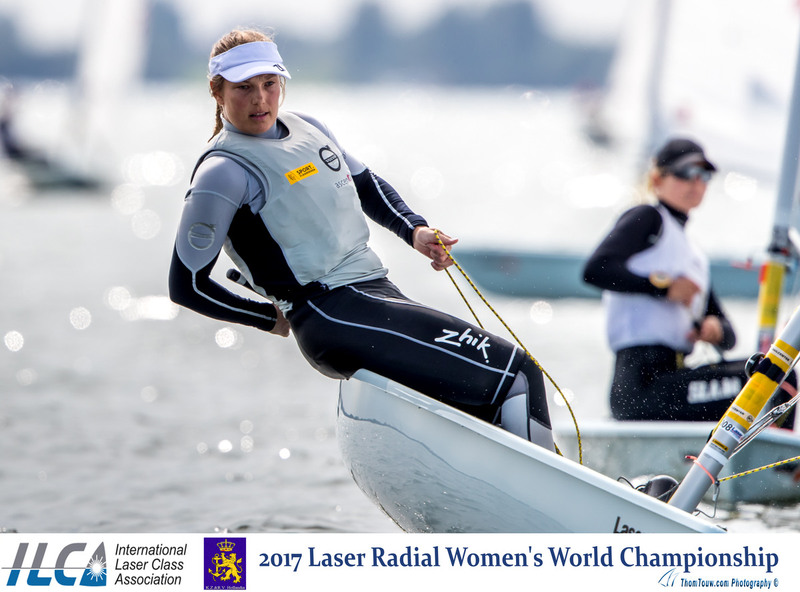 (Medemblik, Netherlands) – Two races were completed today in all three fleets, kicking off the Laser Radial World Championships in Holland. The morning brought glassy waters and postponements, but by early afternoon, the wind on the IJsselmeer built to about 7 knots. The women’s division, comprised of Olympians, World Champions, and up and coming talented sailors, showed the height of competition in their racing today. Each mark rounding had a different leader and for most of the fleet, positions were constantly shifting. But for a few sailors, such as Canada’s Isabella Bertold, the conditions were to their liking. In the first Yellow Fleet race, Bertold rounded the first mark in third, but by the second upwind leg she was leading the fleet and maintained her distance through to the finish line. In fact, Canadians claimed the first race in both fleets, as Brenda Bowskill sailed to first place in the white fleet, with Uruguay’s Dolores Moreira Fraschini and Germany’s Pauline Liebig close behind. For the second race, the wind had dropped to 5 knots, and Monika Mikkola of Finland was quick to navigate the light wind in the yellow fleet. She worked her way to the front on the final downwind with Slovenia’s Kim Pletikos and Belgium’s Evi Van Acker chasing her to the finish. In the white fleet, the second race was a close one. 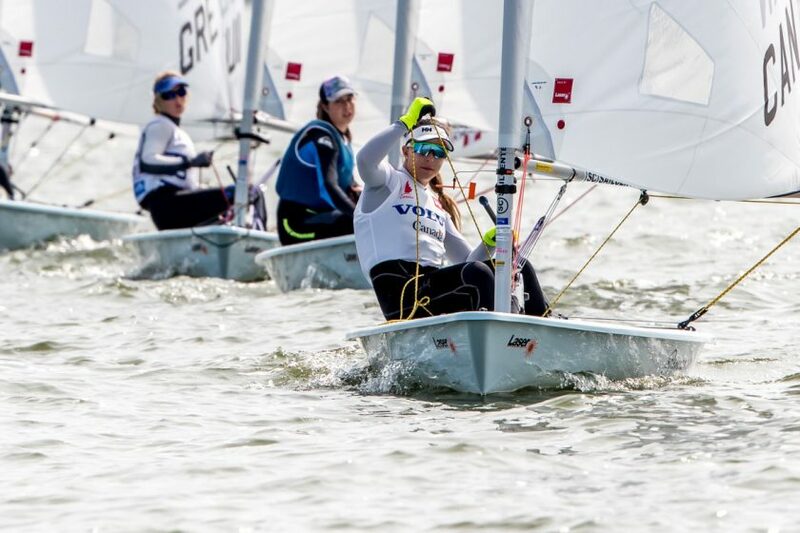 As the top five positions changed throughout the race, Guatemala’s Isabella Maegli eventually sailed her way into first place after battling Svenja Weger of Germany right down to the final reach mark before the finish. “Today was very tricky,” Greece’s Vasiliea Karachiliou shared. “I was playing middle right, but then suddenly after two thirds of the upwind, the left came in. I dropped from being in the top five down 15th with one shift. It was better to pick one side, but I think in the end, the left always paid off and came in suddenly.” The women who played the left and remained consistent were Pletikos who sits in first overall with 5 points, followed by Van Acker at 7 points, and Weger in third with 10 points. 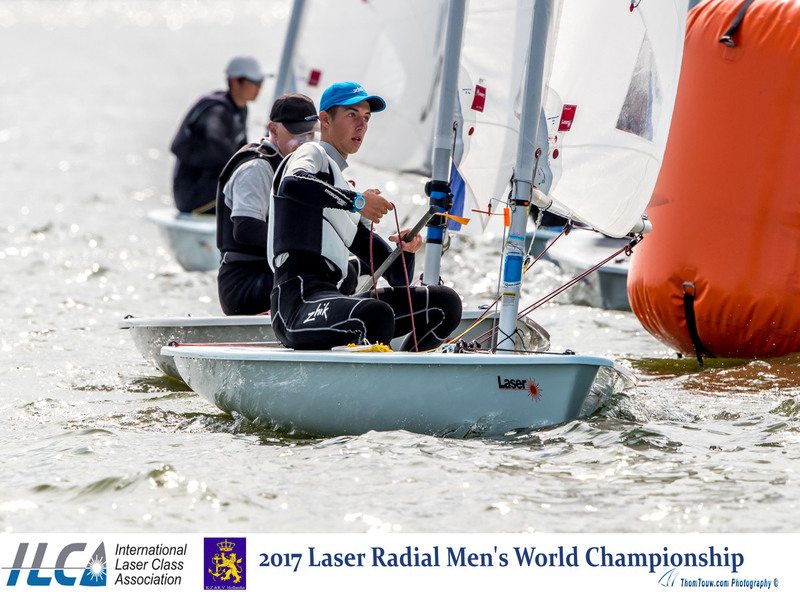 In the men’s division, the first race began with Daniil Krutskikh of Russia punched out in front, but it was Brazil’s Andrey Godoy, sailing very quickly in the light wind., who sailed to a comfortable victory. Krutskikh was determined to reclaim first place, and in the second race he sailed his way to the top with Italy’s Nicolò Elena, Alfonso Fernández of Spain, and Godoy on his tail around the entire course. Overall, Godoy sailed consistently and sits in first place with 5 points, Fernández is in second with 8 points, and Krutskikh holds third with 15 points.